Slippery or sticky frictions discs are a thing of the past. 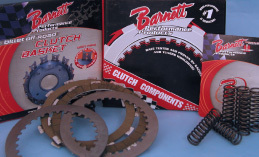 We can deliver clutch elements made by BARNETT for almost all models. The heavy aluminium clutch baskets are CNC machined and utilizes stainless steel inserts to eliminate grooving from the clutch plate tabs. The stability of the components has been proved by repeated success in motor sports. 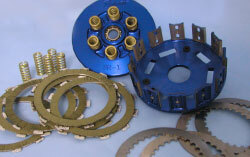 Clutch springs, steel discs, coated aluminium discs, friction discs and clutch baskets. 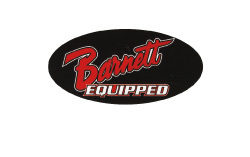 Aprilia, ATK, BMW, Bombardier, BSA, Bultaco, Can-Am, Ducati, Gas-Gas, Honda, Husqvarna, Jawa, Kawasaki, KTM, Maico, Moto Guzzi, Polaris, Rotax, Suzuki, Triumph and Yamaha.